Do not ignore a call from me when you know I am feeling neurotic about a boy. That is Best Friend 101.” —NashMaggie and Nash are outsiders. She’s overweight. He’s out of the closet. 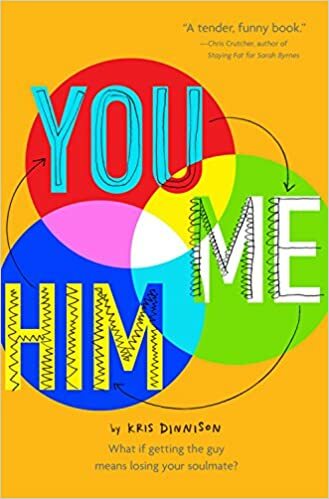 The best of friends, they have seen each other through thick and thin, but when Tom moves to town at the start of the school year, they have something unexpected in common: feelings for the same guy. This warm, witty novel—with a clear, true voice and a clever soundtrack of musical references—sings a song of love and forgiveness. Maggie's voice was very strong and powerful. I enjoyed reading about her because she seemed like one of my best friends with her funny and vibrant personality with a love of music. I adore that this book dealt with being overweight in a body positive way. I couldn't help but cheer for her and succeed in anything that Maggie did because she reminded me of myself. I found her friend Nash to be funny and engaging, but so moody at times that I wanted to just push him off a cliff. He didn't appear to care about Maggie at times and instead focused on how he felt that he was being "wronged." Tom was a cool and charming kid that ended up hanging out with them. Disclosure: This book was purchased by me. The Jewel means wealth. The Jewel means beauty. The Jewel means royalty. But for girls like Violet, the Jewel means servitude. Not just any kind of servitude. Violet, born and raised in the Marsh, has been trained as a surrogate for the royalty—because in the Jewel the only thing more important than opulence is offspring.Purchased at the surrogacy auction by the Duchess of the Lake and greeted with a slap to the face, Violet (now known only as #197) quickly learns of the brutal truths that lie beneath the Jewel’s glittering facade: the cruelty, backstabbing, and hidden violence that have become the royal way of life.Violet must accept the ugly realities of her existence... and try to stay alive. But then a forbidden romance erupts between Violet and a handsome gentleman hired as a companion to the Duchess’s petulant niece. 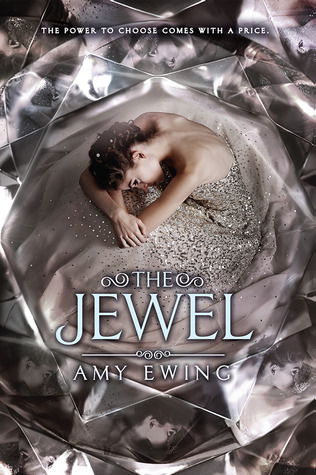 Though his presence makes life in the Jewel a bit brighter, the consequences of their illicit relationship will cost them both more than they bargained for. I found Violet to be a likeable character. The position that society places her in gave me a lot of empathy for her and I cheered for her to succeed by finding some way out of it. I like that she took some risks to get a better life, but at the same time, I found that this made her seem naive as she plunged into another world that she didn't completely understand or comprehend. I found the romance to be very sudden and Insta-love and I wished that there was more development on it. As a result, I didn't care about the romance. I was actually more interested in the political system because the manipulation seemed like the power moves made in House of Cards. I wish that there was more of that, but I understand the need to leave some questions unanswered and I am excited to see how this series will continue. This book takes on both dystopic and fantasy elements, which surprisingly blends well together. On the other hand, I found some similarities to other dystopian books to be intense at times. Ewing's writing did grasp me and led me to finish this book rather quickly (Almost one sitting!) and I enjoyed it, but I didn't love it. I feel that this book mirrors aspects of The Handmaid's Tale, Wither, and The Selection and I would suggest this book to fans of those books. The end made me want to read the next book, but I don't feel the need to read it right away. If you like a character placed in a difficult situation, a quick and fast plot with political intrigue, and books with dystopian and fantasy elements, then I would suggest this book. It isn't amazing or bad, but more so just good and interesting. Sorry for the impromptu hiatus and disappearance from the blog. I have been super busy with many, many things. But lately, I've missed blogging a lot. So just to catch you up on my life and we can get back to talking about books!. 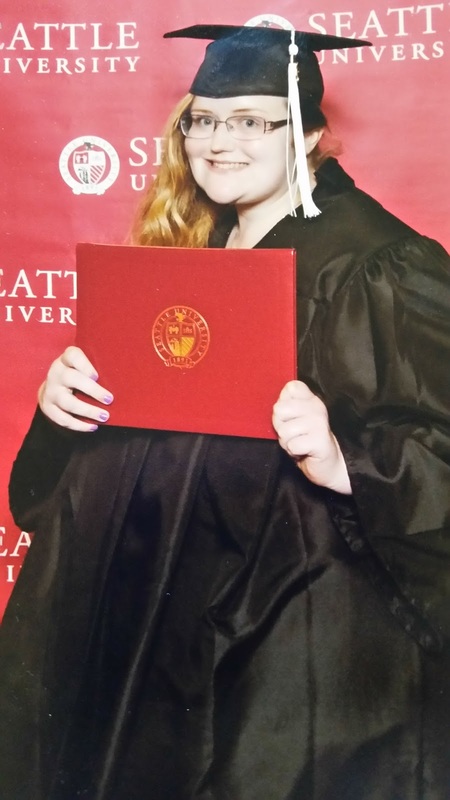 In June, I graduated from Seattle University with a BA in Creative Writing. The most common question is what's next for me? So, thank you for sticking it out and I hope that you enjoy the new content that I have planned. It is a mix of writing and reading, but I hope that you enjoy it. Let me know how you all are doing and we'll talk soon. Gayle Forman's new book I Was Here is set partially in nearby Tacoma. To celebrate the launch, she has been having friends and fellow authors meet up with her. 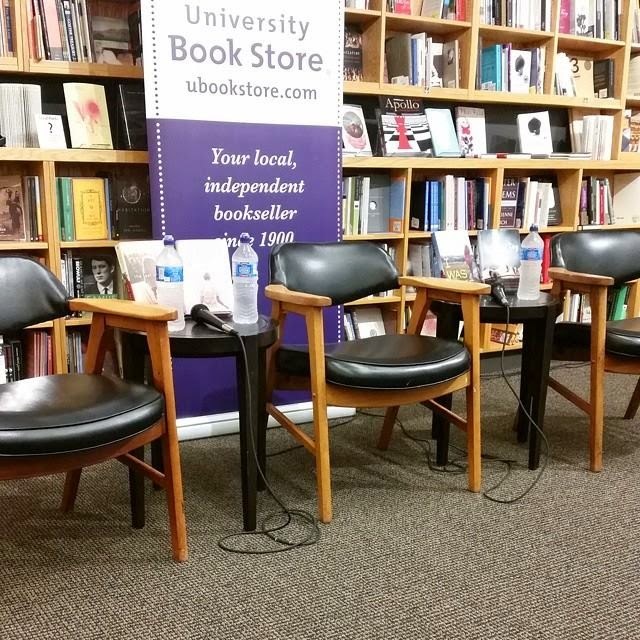 Tonight Nina LaCour and Deb Caletti joined her for a conversation at University Bookstore in a very rainy Seattle, WA. They talked about their writing process and how do they revise. They also talked about how they name their characters and how they feel about setting. A general theme of the night was friendship as they reflected on their writing experience and lives in general. The night felt like overhearing a conversation of friends and was very much enjoyed by me. Earlier that night, I had the opportunity to briefly talk with Gayle and ask her a few questions. S: Why did you decide to write contemporary with many other genres in YA? Gayle said that it is the world that she lives in and it is where she can explore many of the questions that she is drawn to. S: What are some of your recommended reads? Jandy Nelson's I'll Give You the Sun, Jacqueline Woodsen's Brown Girl Dreaming, and Coe Booth's Tyrell Series. S: What is the best writing advice that you have received? "Hard Writing makes easy reading." S:What inspired or influenced you to grapple with suicide? Gayle said that she was inspired by an article that she wrote about suicide; which, introduced her to Suzy Gonzales, who didn't seem like someone that would commit suicide from many of the people surrounding her. Gayle wanted to deal with being on the receiving end of a timed suicide note from someone that you love and that you find incredibly gifted and amazing. Over the writing process, she found that it was more about survival and loving life as she explored Cody's character and revised the book..
S: What are your upcoming books? Gayle said she is currently working on three books, which has recently become more so between two books. She likes switching, because it makes the writing seem more fresh and exciting. 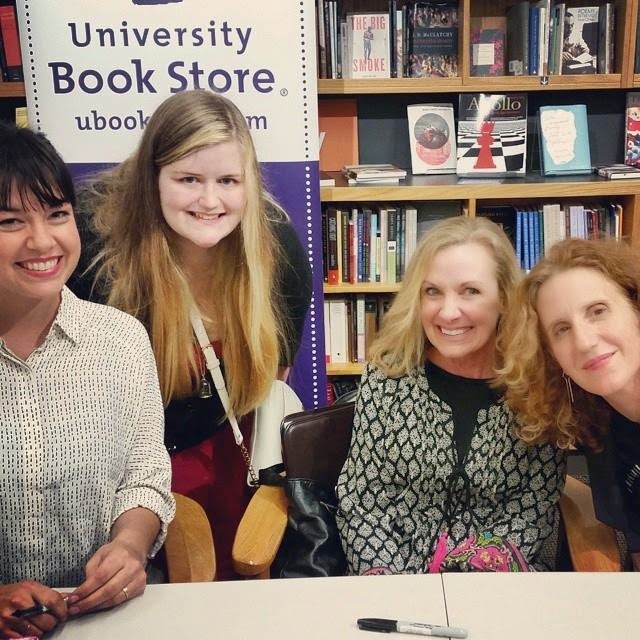 Thank you to University Bookstore for hosting; Penguin Randomhouse for organizing the interview and the tour; Gayle Forman, Nina LaCour, Deb Caletti; and you for reading this.